We here at What’s Trending never shy away from showing a good fight video, but never have we been quite so struck by a video showing such intense opposition of wills, such grand battle between two opposing forces, forces which are equally matched with the one weapon almost all human beings have on them — the gosh darn flip off! Heck yeah! In the video above, two mysterious combatants can be seen flipping each other off, giving each other the bird, throwing up the middle finger, raising it on high for chaos and pain to be engaged with on the level that humanity can only understand. For in conflict we discover our true selves, our true forms, and these two dorks? Eh, kind of lame and impotent, right? 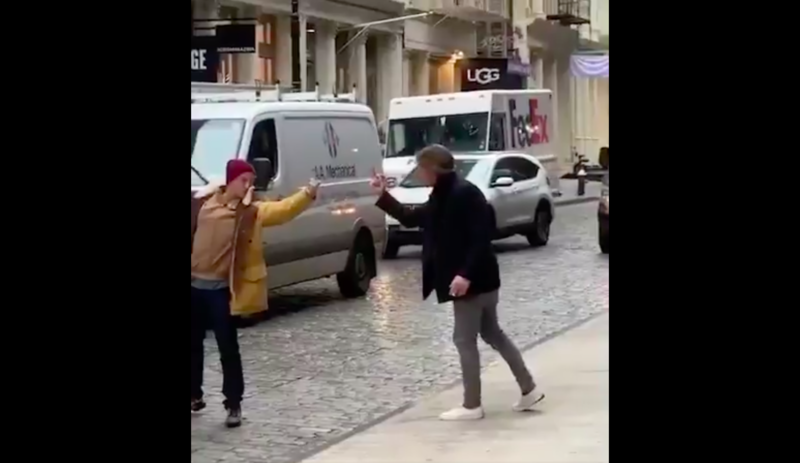 The grand and noble flip off fight has gained traction on Twitter as many are curious just what these guys’ deal is… and pointing out that gosh, they sure remind Twitter users of themselves, don’t they? Here are some reactions from the eternal flip off fight that is the massive internet. These two warriors, meeting on the field of battle, insulting each other unto infinity, disturbing traffic in the process. Truly life is a journey and theirs is but an epic adventure that we are mere witnesses to the glory of therein. Glorious. Do you want to see more of our dumbest fights on here? I mean, of course you do. Well, here are two snakes fighting as they break through someone’s ceiling! What’s that? You freaks want more? Well, here are some weird fights that happened in a school. I don’t know, you want more fights? You’ll find them. You’re a bunch of freaks, you know where to find that stuff. What do you think of the big flip off fight? Let us know in the comments or on Twitter at @WhatsTrending.